GPIC has been in the news recently. There is a group of activist investors owning about 6% of the outstanding shares interested in getting someone better suited to be on the board. The investors, Enclave Asset Management et al, has claimed that GPIC has not had the business owner’s best interest in mind. The claims include not utilizing the cash hoard, self-dealing, and not implementing a strategy to fully exploit GPIC’s proprietary technology. These types of things are all too common with small cap “value” stocks. The key is to separate the value stocks from the value traps. I can only spot the glaringly obvious misallocation of capital. I couldn’t tell you if management has fully exploited their proprietary technology. I can tell you that there is way too much cash on the balance sheet. I thought now might be a good time to review my position in GPIC as well as share one of my valuation metrics. What I am really doing is finding out the fair price of the business and adding that to what I figure is excess capital. The most obvious excess capital being cash, but it can be really any asset. This is based on the Bruce Greenwald book “Value Investing” and . I’m sure everyone has heard of it. You start with adjusting tangible book value. The idea is to turn the balance sheet from a cost form of accounting to a replacement value. It sounds pretty easy, but is quite difficult in practice. You should be taking out intangible assets and goodwill, and replacing them with some multiple of what the company spends on development and brand maintenance. The tough part is how to determine what multiple (usually in number of years) to use. I try using something between 0-3 years. I also use some operating metrics to determine. You can also capitalize the expenses, but again how many years and at what rate? We can see that the CCC and ebitda margins have been stable, while ROC has been moving up. Another point is to attempt to determine what cash is not needed in the business. Different companies have different working capital requirements and may keep substantial amounts of cash idle on the balance sheet. When you read the book, Greenwald goes through many more adjustments. For GPIC they are almost immaterial, so I ignored them. For GPIC, I simply multiplied the marketing expense by 0.50 and added it to tangible book value. At this time I will normalize earnings for the business. 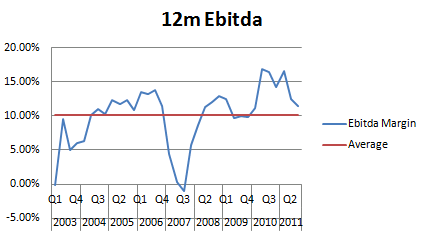 I normalize ebitda margins and sometimes revenue if it has moved too quickly in one direction or another. Once this is done I remove the run rate D+A to get to EBIT. Another adjustment that needs to be done is to adjust SG+A to back out any growth expenses. The idea with EPV is that it is a no-growth scenario. For GPIC, I removed 20% of SG+A. Then you take off taxes at the appropriate rate to get a ballpark net income. Now you need to adjust for capital expenses. You need to be aware of companies that require much more than D+A to maintain their position in the industry. You need to add back D+A and only remove what the business requires to maintain its position, again talking no-growth. For GPIC I only subtracted 80% of the stated capex for maintenance. Moving on to the multiplier. Which is really dividing by what you estimate as the cost of capital. I have tried using WACC and adding a certain amount of basis points to the overnight lending rate, but haven’t settled on anything. For small companies my cost of equity is always 15% and my cost of debt is what the company paid recently or what competitors are paying. Once you have the business value down you add in any excess capital and minus debt. Here is where I get off the bus. I never use the growth value. I have a very tough time determining when growth will be accretive in the long run. 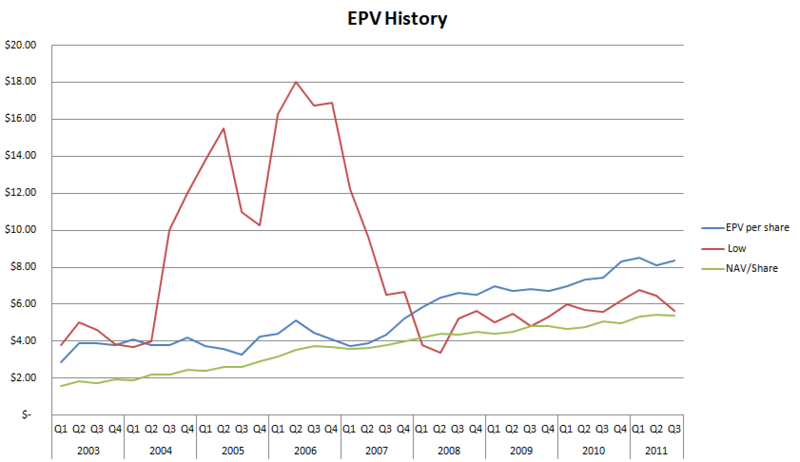 Here is what the EPV value looks like for GPIC. Determining when to buy and sell is another issue. Some buy at NAV and sell at EPV. Some buy at a discount to one or the other. My conservative EPV is $8.20, with NAV being $5.40. I will hold for now as some other valuations give a fair value of well over $10. To be honest I am using this valuation metric less and less. It has a few shortcomings that I feel lead to people like me buying value traps. There is zero assurance that you will see that excess capital, so the market may simply value this as a business. Like any quantitative measurement, we are looking backward in time. But all of our money is riding on the future. We haven’t even talked about a catalyst to unlock value. Lately I have been looking at companies that have been growing earnings and trying to spot a catalyst. I also don’t want a ton of cash sitting idle. You still have to really think about portfolio construction. I only use EPV as a blunt object. I don’t have the industry knowledge to determine the precise value. I always use it in conjunction with other metrics and use EPV as a canary in the coal mine. I would love to hear anyone’s thoughts on EPV and its practicality. What exactly is excess cash? To me it means cash that is on the balance sheet that is not needed in day-to-day operation of the business. Some companies have no excess cash and some have enormous amounts of excess cash. This post may seem like review to some, but a younger version of myself would have benefited from this insight. Velan (VLN on TSX) manufactures and markets industrial valves. Revenue growth over the last 10 years has been slightly better than inflation. The company has a very long sales cycle, as evidenced from the CCC being over 200 days. Currently stated net cash is just over $5 per share. This seems extremely attractive to anyone buying the shares now (around $13). You can say that I am buying the business for $8 ($13 minus $5). Average EPS for the last 5 years is $1. So I am paying 8 times earnings, which seems very cheap. This of course is oversimplistic, but it proves my point. But wait a minute, over the last 10 years there has been at least $25 million in cash on the balance sheet (or about $1 per share). This may mean that there will always have to be $25 million cash on hand. Now your valuation goes to 9 times earnings, ($13/share minus $4/share in excess cash divided by $1 in EPS). Also we must consider that VLN has had revenues fall sharply during the recession and are not likely to return for quite some time. Working capital will need to be adjusted as well. Something that is very important is the voting structure of the company. The Velan family has voting power, which leaves almost no chance of activist involvement. The family can take the company private, but I am reluctant to speculate on that. I think there is little chance that the cash will be returned to shareholders anytime soon, meaning there is excess cash in the company, but I wouldn’t consider net cash in any part of my valuation. The cash position should be considered when examining balance sheet strength though. Buying this company at 13 time average earnings is not cheap, especially considering how far away average is from here. Jewitt-Cameron (JCT on TSX) was originally analyzed by Adam over at ValueUncovered here. JCT has also been extremely hard hit by the recession. The company usually carries some cash on the balance sheet, usually a couple hundred thousand, against revenue (usually) in excess of $50 million. Recently, the company has come into a large amount of cash. Given the fact that the company doesn’t carry much cash usually, and isn’t afraid to use short-term borrowings, I think it is safe to include all net cash as part of the valuation. Westjet (WJA on TSX) has been mentioned before. The CEO said on a conference call that he thinks the company needs around 40% of revenues in cash on the balance sheet. I think he is being too conservative. I think it is more like 20%. I will have a more detailed post on Westjet shortly. I think you can include some of the cash as part of your evaluation as management seems to be able to deploy it at attractive rates. ABC is at $10, have sustainable earnings of $1, net cash of $5. 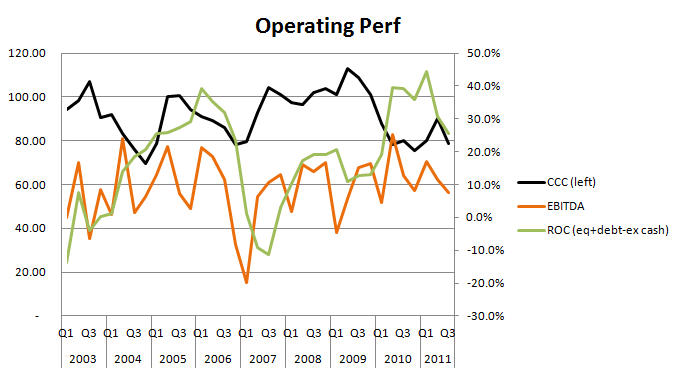 Net cash P/E is 5. Very cheap. You could consider “fair value” at 10x earnings plus net cash, making $15 a target. You are buying at 67% of fair value. What if the company was like VLN, meaning there is cash, but you aren’t likely to see it. Your 10x earnings plus net cash now yields a $10 stock, or current purchase price. You have NO margin of safety. What if the earnings are $0.75 and the company has $7.50/share in cash. Fair value is still $15 (10x earnings of $0.75, plus $7.50 cash), but now the valuation is 50/50 business and cash. If you are not going to see that cash, then fair value moves to $7.50, meaning that buying at $10 gives you negative margin of safety. I think you get the point. A big thing to consider is how much of fair value is cash and how much is earnings power. In the previous example, $15 fair value was 67% earnings and 33% cash. If fair value is mostly cash, then I think there is an added element of risk that isn’t discussed enough. Most of the value is cash, then a simple return to shareholders is best, but the company can go on an acquisition streak at the height of a leveraged economic expansion. Buying back your own shares at a huge premium to book or earnings is not accretive, yet most companies to just this. My point is the larger the cash portion is of the total valuation, the better the company should be at deploying that cash. Makes sense, right? It is up to each investor to determine what exactly is excess in the excess cash calculation. It is easy to punch some numbers in a spreadsheet and have it spit out a fair value, but investing is an art not a science. Despite what many think, the market is pretty efficient, and it takes some pretty big extremes to get outsized returns with little work. The author own share in WJA at time of writing, and would like to own shares of JCT (if it was cheaper).